NEW YORK -- Manuel Guzman had never seen his son play major league ball in person because he's never been a fan of planes. Ronald Guzman became the first rookie to hit three home runs in a game against theYankees, powering the Texas Rangers past New York 12-7 on Friday night. Guzman grounded out his first time up, then hit solo home runs in three straight at-bats. He batted again in the eighth with a chance to tie the big league record for homers in a game -- no rookie has ever hit four -- but struck out swinging against Chad Green. 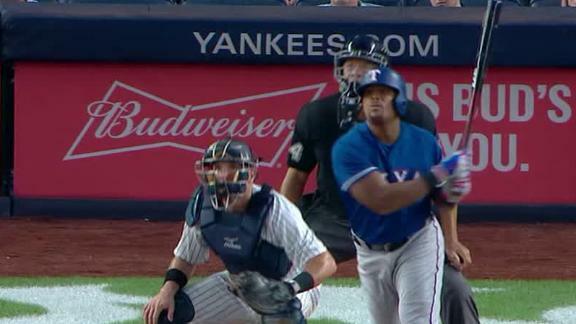 Adrian Beltre passes Chipper Jones on the career home-run list and drives in four runs in the Rangers' 12-7 win over the Yankees.